If employee engagement is the great untapped resource, why are only 25% of employees truly engaged? Winning with a Culture of Recognition reveals: Most managers fail to recognize performance and connect it with company culture. This book shares successful methods implemented by leading companies such as Symantec, Intuit, and Dow Chemical, demonstrating how any company can create a positive culture of appreciation. In just nine months, Symantec realized an impressive 14% increase in employee engagement. Intuit achieved and sustained an 11% increase in employee engagement over five years. Of the 95% of employees participating in recognition at Intuit, 99% clearly understand why they've been recognized and 93% say the recognition motivates them to sustain high performance. 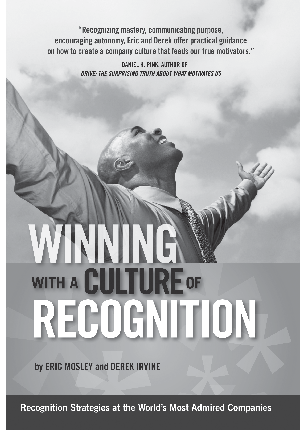 Download your free chapter of Winning with a Culture of Recognition now.